There's a lot of talk about how Green Jobs are going to save the U.S. economy. I have high hopes for this, but at the same time I have worries. The word "Green" is being bandied with imprecise meanings. What does "Green" mean? Who defined this term and what is their goal? And is it what we think it is. It seems to have an underlying meaning about technology or practices that have beneficial environmental effect. But what is that beneficial effect, what is really meant, and do they mean to make a significant environmental improvement or do they mean to spin it so that greenwashing is enough? If we don't know where we're going then how do we know when we get there? If the leadership of the country says we're going in a given direction, how can we judge if the results match the goal we're being given? I'm happier with the word 'Sustainable' than 'Green'. Sustainable has some clear meaning even though it also seems to suffer from imprecision. Still I want to know more about the meaning of Sustainability, Sustainable Technology, Green Technology, and where we are headed. For this episode I browsed through a chapter in Peak Everything by Richard Heinberg. The book takes the peak oil model and extrapolates it out to other resources. One chapter is an exploration of Sustainability and what it means for our society. The word itself means "that which can be maintained over time". Very nice. Gayanashagowa or the Great Law of Peace of the Iroquois (or Haudenosaunee) Six Nations is the oral constitution that created the Iroquois Confederacy. The law was developed by a man known as The Great Peacemaker and his spokesman Hiawatha. Member Nations ratified this constitution near present day Victor, New York. There is an essential concept of sustainability said to be within this law, a concept familiar to someone who has seen the front page of this site or to someone who has bought household products from a particular company. Richard gives this concept as: that chiefs consider the impact of their decisions on the seventh generation to come. I've always loved that principle which is why this site bears the name it has. It is key to sustainability in terms of a society which can be maintained over time. Sustainable Development: is development that meets the needs of the present generation without compromising the ability of future generations to meet their own needs. 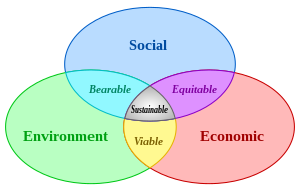 (wikipedia) In other words the official definition of Sustainable Development is a restatement of the Seven Generations principle. 4. and, in that society, people are not subject to conditions that systemically undermine their capacity to meet their needs 4. eliminate our contribution to conditions that undermine people’s capacity to meet their basic human needs (for example, unsafe working conditions and not enough pay to live on). Sustainability requires that substances introduced into the environment from human activities must be minimized and rendered harmless to biosphere functions. A point which surfaces over and over through this chapter in Peak Everything is to equate Sustainability with a requirement for the Natural World to stay as it is. Sustainability is being defined in terms of reducing or eliminating harmful impacts on the natural world. While it is my belief our society dreams of living in a garden paradise, I wonder if preserving the natural world as it is today is the only way to attain sustainability in terms of maintaining human society over the long term. His Axioms require use of renewable resources and a cessation of use of non-renewable resources. A key axiom is the first, unsustainable use of critical resources means the collapse of society. Consider water such as the several aquifers being mined by societies faster than the rate of replenishment. Aquifers receive water when it rains and the rain is absorbed underground and flows through rock formations. The average rainfall contributes a certain quantity of water every year, and if the humans living above the aquifer never use more than the amount added every year the aquifer will provide water forever. But current practice is to pump water out of the aquifers as fast as it will flow, in many cases leading to sucking them dry within a generation or so. This is not a sustainable practice because for example the city of Phoenix Arizona is in a desert, and there are over a million people living there, and how will they get water when their aquifer runs out and there's never more than an inch or two of rain a year? It seems he is only looking to the natural world to provide the resources we require to live. The natural world does provide the basics of life, the water, the air, food, materials with which to build shelter and clothing, etc. It makes sense then to make use of the natural world at a rate the natural world is able to sustain. Extracting resources from the natural world at a rate faster than it can sustain, leads to collapse of the natural world's ability to provide the resources which give us our lives. Another example is fishery collapses around the world. These happen when fishing happens at too great a rate and the fish populations are unable to provide enough fish. Over-fishing leads to fishery collapse. The garden paradise of our dreams has a carrying capacity. The garden paradise can provide only so much stuff and remain a paradise. Extract too much stuff from the paradise and it collapses perhaps becoming a desert. The rate of natural replenishment gives an upper bound on the rate of sustainable resource use. There is a strong correlation between growth of population and growth of resource use. Hence his axiom to limit population growth and/or resource growth. However I believe it is technically possible to limit the growth of resource use while allowing population to grow. It means ensuring all technologies are made more and more efficient over time, and that we always strive to do more with less, to use the minimum of resources in our activities. This idea runs counter to some cultural normalthink of the kind that drives people to owning hummers. We all want this society to last forever. Technically it cannot last forever if only because in a couple billion years our Sun will burn out. In any case this expectation is real and is an unquestioned assumption that's all around us. I suppose the Romans during the era of the Roman Empire also thought their society would last forever. But given the above discussion it seems plainly obvious that this goal we have for our society to last forever, that it requires our society to adopt sustainability as a core principle. This is an absolute hard requirement, for our society to last forever we must adopt sustainability.